When Andrew Peacock made the move from Ontario to Newfoundland, he thought he was kicking off his career as a newly qualified veterinarian with an adventure in a temporary location. It was certainly an adventure--a whole series of adventures--but there was nothing temporary about it. He practiced in Newfoundland for nearly 30 years and is still living there. In fact, he has lived there so long, the locals are starting to think of him as one of them. Creatures of the Rock chronicals a career spent working with and getting to know a rich variety of animals and their owners, on farms, in homes and in the wild. Andrew was the only vet for miles around. A day of practice could include anything from a Caesarian section on a cow in a blizzard to freeing a humpback whale from a trap designed for cod to capturing a polar bear after its surprise visit to a bingo parlor. And, on the human side, anything from trying to impress a surpringly large audience of farmers with your first boar castration, to taking care of a family just as well as its stricken cat, to discouraging farm hands from helping themselves to hypodermic needles. All this against the background of a domestic scene in which Andrew's wife Ingrid--also freshly qualified, as a doctor--shares the adventure of making a new life, and in due course of starting a family. Told in a series of brief, endlessly engaging stories, Creatures of the Rock is a funny, thrilling, unflinching but ultimately heartwarming narrative about the connections between people and animals, and people with each other. Recently, memoirs have been all I wanted to read. After reading A Mother’s Reckoning by Sue Klebold, the mother of a teenaged mass-shooting perpetrator, and The Education of Augie Merasty, a residential school memoir, I decided for something a bit less traumatic. Creatures of the Rock: A Veterinarian’s Adventures in Newfoundland is the light, humorous memoir of a now-retired provincial veterinarian in Newfoundland. Each thirty-six chapters relate a noteworthy event, ranging from difficult calf births and horse wounds to whale rescue and caribou relocation. What emerges right away from this book is the author’s love for Newfoundland. Born in Ontario, he had initially “agreed [he and his wife] would work in rural Newfoundland for two years and then move on to further adventures”. However, the couple fell in love with the place and still live there three decades later. Peacock repeatedly praises the landscape, from the “beautiful valley between two rocky ridges” (North River) to the “breathtaking” drive to the Cape Shore region. His enthusiasm is very contagious and definitely makes you want to see Newfoundland for yourself. In order to be economically useful, a cow must produce milk at a level that puts great strain on her body. Dairy cows commonly run into health problems caused by this unnaturally high production of milk. These diminutive cows [the Jerseys] are pushed to make so much milk relative to their body size that they can lose a lot of calcium they need to keep their bodies healthy and to maintain normal brain activity. Without enough calcium, cattle can get very sick and even die. The goal with individual cows is for them to have a calf and then produce milk for about three hundred days. The cow then gets a break for about sixty days before she is expected to have another calf. This works out to a cycle of about one full year: a cow’s pregnancy lasts around nine months, leaving her three months to get pregnant after delivery. I am not sure that this is what Andrew Peacock intended, but I have not been able to drink any cow milk since I read his book. This book might have done to me what vegan activists never managed to. This being said, I wouldn’t say Creatures of the Rock was an exciting read. While there is definitely value in Peacock’s experiences, the narrative is very lacking. It often feels dry and cold, with a focus on the technical aspects of his interventions. He often breaks any possible tension in a story by stating that a calving issue will wait till the end of his amateur hockey game, or a suspicion of dog abuse a few days. While several stories were insightful, especially the one about a little boy facing the awful choice to euthanize his cat, many others weren’t that impressive. At times, I felt frankly bored. 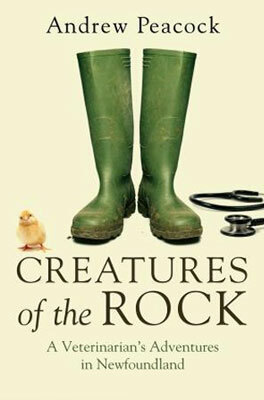 Overall, Creatures of the Rock is an easy, entertaining read, perfect to accompany a vacation or a long week-end. It is always fascinating to have a peek at other people’s experience and other places. However, it is not the most thrilling book, as the writing unfortunately lacks of stamina and some stories may leave you with an underwhelming feeling.